Book 2 of The Bells of Lowell. The mill town of Lowell, Massachusetts, beckons Arabella Newberry when she decides to flee the life of the Shakers. There she finds the independence she seeks and a greater purpose as she works for educational reform. But Lowell, plagued by ethnic strife, seems no longer a safe haven but rather a danger when several girls go missing. As rumors and conflict invade the industry of the mill, Arabella struggles with her own heart as two men vie for her love. 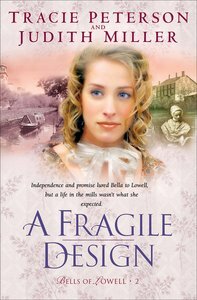 About "A Fragile Design (#02 in Bells Of Lowell Series)"
A romantic historical novel about a young woman angry at the factory owners on whom she blames her father's death. Bells of Lowell book 1. Book 1 of THE BELLS OF LOWELL. The mill town of Lowell, Massachusetts, comes to life with intrigue and drama from the creative writing team of Judith Miller and Tracie Peterson. Young women at the end of the 19th century seek employment from driven men intent on transforming America's textile industry. Daughtersof the Loom features Lilly Armbruster, who is forced to work in the mills as her only means for survival. But Lilly's resentment runs deep against the "lords of the loom"--the men she believes have stolen her father's farm and caused his premature death. Her animosity happens to include Matthew Cheever, her childhood friend and one-time betrothed. Though separated by their opposing views about the future of the mill and the community that surrounds it, the emotions of their hearts still bind them. Will their dreams for the future allow their fragile love to survive? Tracie Peterson is a full-time author who has written or co-written over fifty novels in both historical and contemporary genres, including the WESTWARD CHRONICLES, the YUKON QUEST and the SHANNON SAGA series. The Fate of the Textile Industry Is at Stake Along With Her Own Fate! Raised in an atmosphere of equality, Daughtie Winfield is outspoken in her support for the rights of others, from the mill girls threatening a strike over pitiful working conditions, to the immigrants living on the other side of town. So she is unprepared for the hostility - even from some who claim to hold similar beliefs - aroused by her growing friendship with Liam Donohue, an Irish artisan. Behind the scenes, a disgruntled former employee conspires with a one-time mill partner in a devilish plan that imperils not only the operation of the mills but those dearest to Daughtie. As dissention and upheaval threaten the future of the textile industry, Daughtie longs for peace - in her working world, and deep within her heart.